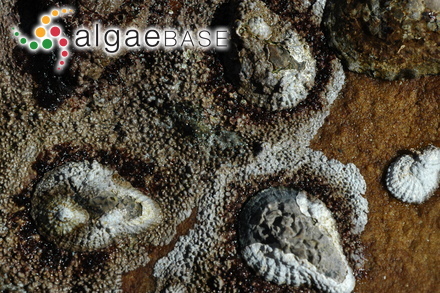 Platboom, Cape Peninsula, South Africa; lower intertidal with Garden Limpet and Gelidium micropteron. 21 Sep 2005. Michael Guiry. © Michael Guiry (mike.guiry@nuigalway.ie). Published in: Chamberlain, Y.M. (1993). 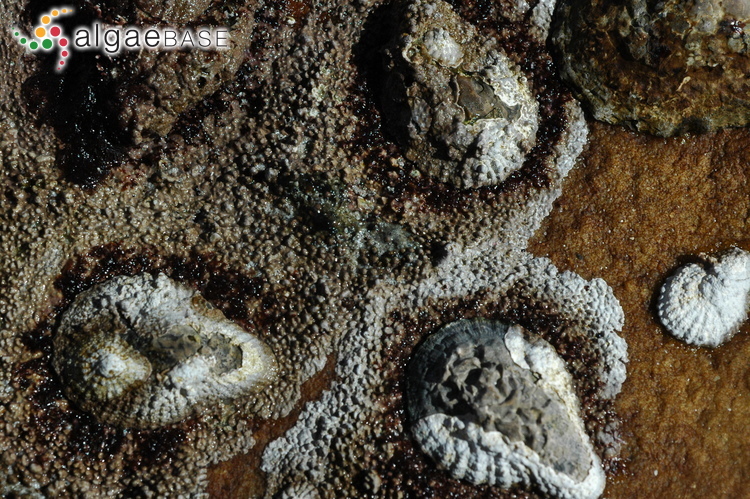 Observations on the crustose coralline red alga Spongites yendoi (Foslie) comb. nov. in South-Africa and its relationship to S. decipiens (Foslie) comb. nov. and Lithophyllum natalense Foslie. Phycologia 32: 100-115, 56 figs, 1 table. The type species (lectotype) of the genus Spongites is Spongites fruticulosus Kützing. Lectotype locality: Shimoda, Shizuoka Prefecture, Japan (Silva, Basson & Moe 1996: 272). Lectotype: K. Yendo No. 66; April 1899; TRH A1-53 (Woelkerling et al. 2005: 30). Notes: This type locality was first recorded by Foslie (1904a: expl. pl. XI). Chamberlain (1993: 102) cites Shimodo Harbour, Izul, Japan as the type locality. Chamberlain (1993: 103) notes: Thin expanses of this species form the main algal component of the Patella cochlear communities that are a prominent feature of Cape (South Africa) rocky shores in the eulittoral zone. Patella shells are often coated with thalli of the marine lichens Pyrenocollema spp. and Spongites yendoi frequently grows on top of the lichens. It also occurs on shells of other molluscs such as Patella argenvillei, P. granatina, Oxystele sinensis and Turbo spp., and grows round the colonial mollusc Dendropoma corallinaceum. It may also form a continuous, thin lining to intertidal pools. It has not been collected subtidally. Penrose, D.L. (1996). Genus Spongites Kützing. In: The Marine benthic flora of South Australia. Rhodophyta. Part IIIB, Gracilariales, Rhodymeniales, Corallinales and Bonnemaisoniales. (Womersley, H.B.S. Eds), pp. 273-280. Canberra: Australian Biological Resources Study. van der Merwe, E., Miklasz, K., Channing, A., Maneveldt, G.W. & Gabrielson, P.W. (2015). DNA sequencing resolves species of Spongites (Corallinales, Rhodophyta) in the Northeast Pacific and South Africa, including S. agulhensis sp. nov.. Phycologia 54(5): 471-490. Accesses: This record has been accessed by users 2267 times since it was created. Chamberlain, Y.M. (1993). Observations on the crustose coralline red alga Spongites yendoi (Foslie) comb. nov. in South-Africa and its relationship to S. decipiens (Foslie) comb. nov. and Lithophyllum natalense Foslie. Phycologia 32: 100-115, 56 figs, 1 table. Keats, D.W., Groener, A. & Chamberlain, Y.M. (1993). Cell sloughing in the littoral zone coralline alga, Spongites yendoi (Foslie) Chamberlain (Corallinales, rhodophyta). Phycologia 32: 143-150.